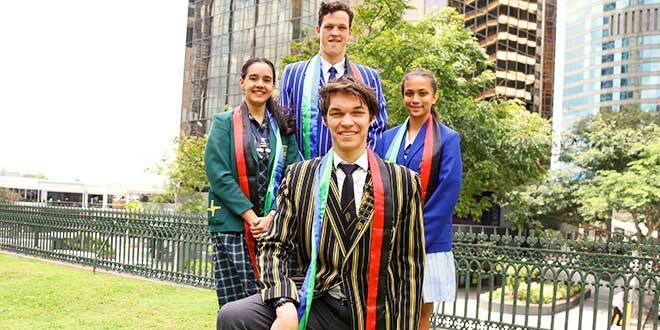 Grateful graduates: Tia Shadford of Brigidine College, Joshua Preval of St Joseph’s, Nudgee College, Kelsey Doyle of St Laurence’s College, and Sahamar Ruben of St Peter Claver College, Riverview who will finish high school this year. INDIGENOUS high school graduate Sahamar Ruben wants Australia’s education curriculum to include studies in Indigenous culture for the sake of non-indigenous students. Miss Ruben, a Torres Strait Islander student from St Peter Claver College, Riverview, said an Indigenous culture class would educate Australians on the rich culture of Aboriginal and Torres Strait Islanders. The grandchild of two Thursday Islanders, Miss Ruben said an Indigenous culture class in Australian schools would help others appreciate her rich family traditions. “I find a lot of people in my school don’t know much about it (Indigenous culture),” she said. Classes could include parts of her family traditions from the Erub Islands in the Torres Strait, like their absolute ban on eating or killing sharks. “We have our family totem of course which is the shark, so we can’t eat that,” Miss Ruben said. “It was made to maintain all the population of the animals. Miss Ruben is one of 155 students with an Indigenous background who will graduate from a Brisbane Catholic high school this year. The graduates gathered for the annual graduation ceremony and Liturgy at St Stephen’s Cathedral, celebrated by Archbishop Mark Coleridge, on October 14. Miss Ruben said the graduation ceremony was a time for Indigenous students across the archdiocese to celebrate their culture together. “It’s great that we have an opportunity like this to all come together for one last time before we finally leave high school forever,” she said. With only two more weeks until her final high school exams, Miss Ruben is already planning for a successful future in medicine. “I want to study at a university; I want to become a doctor,” she said. Miss Ruben said it was important that more positive work Indigenous people do for the community was highlighted. “There’s a lot of negative stereotypes about Indigenous people that non-indigenous people feel and it’s very unfortunate because it’s a very small minority that those stereotypes belongs to but they’re the only ones that anyone ever sees because they’re the ones on the news and they’re the ones in the papers,” she said. “Nobody really sees the positive side of our culture and what a lot of indigenous people do for the community. “Instead they only see the ones that are drinking and in jail. “I hope to break some of those stereotypes especially if I get to university because there are a lot of indigenous people at uni but people just don’t see them, they always see them as drop outs or people who run amok around town. Edit October 21, 2016: The original story mistakenly described Miss Ruben as the granddaughter of two Torres Strait Islanders from the Tiwi Islands. It has been corrected to Thursday Island. The Catholic Leader apologises for this mistake.